What is the Build It Better! Game App? The Build It Better! 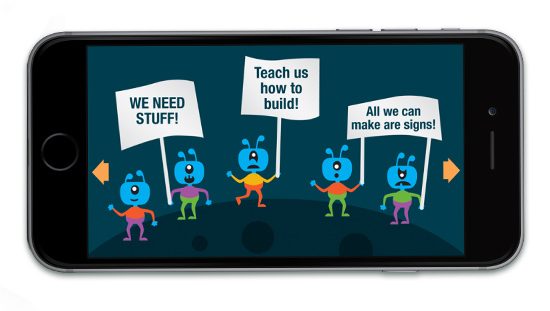 Game is a mobile game application targeted at teaching young minds about manufacturing. Build It Better! offers a well-crafted game experience that is creative, challenging, and fun while encouraging repetitive play. This app is an ideal tool for educators and young audiences (6th to 8th grade students). Experience planet Zorblax and be a hero by helping Zorblaxian aliens build cool stuff that you use every day and will make their daily lives better! Try your hand at building a guitar, a shoe, a phone, and even a scooter with fun materials. Unlock levels, earn reward points, solve trivia and view the products you have built in a gallery. The Build It Better! game app lets you fly into a colorful world of cute aliens who need your help! Travel to the planet Zorblax, and help the Zorblaxians make products they need! Build shoes, bicycles, phones and more, the materials are there, you just need to build them! Choose fun materials like shoelaces, guitar string, phone features and more! Earn points as you’re building and unlock the next level to keep challenging yourself to Build It Better! In search of more of a challenge? Try the trivia after each round! Test your building skills on the planet Zorblax, and see if you can Build it Better! Through exploring the planet Zorblax, you can see how building better products can make a difference in the alien’s daily life! Your job is to take the materials they have, and then make awesome products that can make their daily lives better! Once you’ve built the products for them, try it again, and Build It Better! While helping the Zorblaxians, you will get some great experience in the manufacturing process, and see just how important your role in it could be!